My company uses a lot of batteries to power our equipment. Every battery, even rechargeable batteries, lose their ability to store a charge after a long period of use. 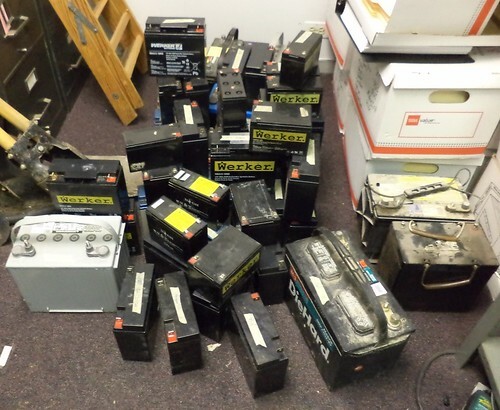 Gradually, over the course of several years, we started to develop a "battery graveyard", we were calling it. Years ago, you would have put this stuff out for the trash. But, in these enlightened times, some places have banned batteries from garbage and it's not environmentally sound policy to chuck as many as we have into the trash. So, we searched for a recycling company that would come get the pile, and what a pile it was. Yeah, this is everything. When we buy new, we write on the battery or affix a bit of tape to it with the month it was purchased. Some places will guarantee a battery will hold a charge within a certain number of months. If it doesn't, you can bring it back for a new one. We hit a spate, several years ago, where the dozen batteries we needed had 4 that were bad from the start. It's frustrating to have to take them back and ask for a replacement, particularly as the battery store was a good 30 minute drive away. We piled everything up and it looked almost like a modern art installation. I think we'll call "Ode to Recycability". The company hired took everything shown here. Now that room is a whole lot cleaner, too, and we'll be getting a check for our efforts. Total win.